She may be hesitant to show off her stunning engagement sparkler from Justin Timberlake, but there is one enviable asset Jessica Biel has no trouble flaunting these days: Her totally hot bod! As the New Year’s Eve actress celebrates her 30th birthday Saturday, Us Weekly rounded up our picks for Biel’s sexiest hot body moments over the years. To see more photo of Jessica Biel, CLICK HERE. Did Justin Timberlake’s grandma spill engagement news? Pretty much everyone but Justin Timberlake has said he’s engaged to girlfriend Jessica Biel, with the latest person sharing the news reportedly being his grandmother. According to Gossip Cop, Timberlake’s grandma, Sadie Bomar, has confirmed that he’s engaged, saying the 30-year-old singer/actor called her on Christmas Day to say as much. She also reportedly said that she’s “so happy” for her grandson, and that “the family loves Jessie [Biel], she’s a very sweet girl.” Aww! Timberlake and Biel actually broke up after four years in March of 2011, but by last August were spotted spending time together once again. A source tells People magazine that Timberlake proposed to Biel with a “custom-designed” ring on the couple’s annual vacation in Montana. 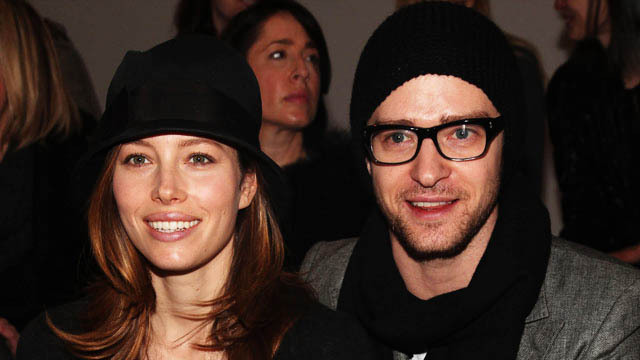 Is it de ja vu all over again for Justin Timberlake and Jessica Biel? People reports that the singer/actor who seemingly does it all these days, was spotted biking around Toronto with Biel, his ex of five months. The pair were reportedly looking pretty chummy as they dined together for breakfast before taking to their two-wheelers for a little jaunt about town. According to the publication, Biel is in Canada shooting a remake of the Arnold Schwarzenegger film ‘Total Recall” with Kate Beckinsale and Colin Farrell. Clearly there are no hard feelings following the break up of their four-year relationship, but do we think this was just a friendly outing or a sign that Timberlake and Biel are reconciling?